I am constantly either taking something big up to the cottage, to the garbage transfer station in Otter Lake, or helping someone move a piece of furniture. Fortunately I have either a SUV or a car with a good set of roof racks but most importantly, I have always been very careful to firmly secure my load. Most SUVs have racks on the roof but most people have no clue what is the safest way to secure their load up there. I am sure you have seen vehicles on the road with loads barely secured - accidents waiting to happen. 1) Use a car-top rack - do not just throw it up on the roof. Most SUV come with them built in, but otherwise be safe go buy, rent or borrow a set of roof racks that (most importantly) fit your roof. Some cars have special groves in the edges of the roof to accommodate roof racks. 2) Secure the load in at least two places on top of the roof. That usually means placing the roof racks as far apart on the roof as possible and securing the load at those points. This means securing the load in two places - one as far forward and the other as far tot he back of the roof as possible. Unless the trip is short - very short - just securing to the roof racks is not secure! You need to secure the load to something solid on the car - this means to something on the vehicle that is NOT going to fall off. It may sound dumb but even running a rope through the windows and back around to the load will work. Sure it may be a bit noisy but it will be safe. 3) Secure the ends of Long and flat Loads. 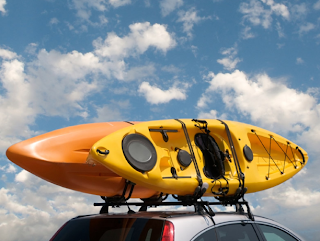 If the load is long and hangs over the hood/back of the vehicle ( like a canoe) then you should secure the ends of the load to the front and to the back. The bumpers are not usually good things to tie to - look for the tow hooks or underneath at the points where the bumpers are attached. This approach is a must when transporting a flat load that can catch the 'wind'. In fact anything that can catch the wind and sail away should have an extra rope or two to secure it. 4) Use the right knot. It is an unfortunate reality that the scouting movement is not attracting as many young people as in the past - hence knot making skills are a thing of the past. The key to tying down a load is to make sure (a) that the knot stays tied, and (b) that it keeps the load tightly to the vehicle. Having been a scout I use a bunch of knots but the most useful is something that is akin to a trucker's hitch. The Cottage Life magazine has a great article on how to make the trucker's hitch knot here. So if it is taking up the canoe to the cottage, moving Grandma's rocking chair, or picking up furniture from IKEA, properly securing the load will make the trip safer for the load, for you and for everyone else on the road.